Part of our monthly series on tea history, which runs the second Monday of each month. 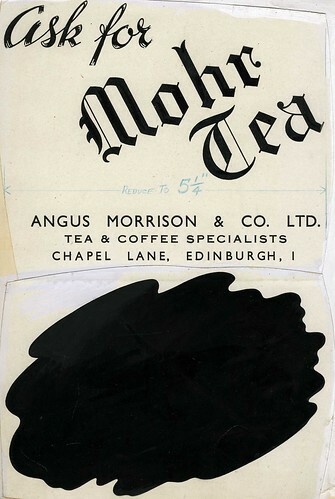 Angus Morrison & Co. were tea and coffee specialists located in Chapel Lane in Edinburgh. Below is an ad for their Mohr Tea. Like many tea brands, Angus Morrison & CO is no longer around. Thanks to Edinburgh City of Print for the image. You can see more of their work in Flickr. What Happens When Yorskshire Tea Take Little Urn to Scotland?